If you’re an email marketer using Gmail or G Suite (formerly known as Google Apps) as your email sending platform, you probably want to understand just how many emails you can send through your Gmail account. First, distinguish between a regular Gmail account and a G Suite account. A regular Gmail account is an account with an address containing the domain gmail.com or googlemail.com. G Suite, the business product of Google, means your email addresses contain your organization’s domain, like john@acme.com or ajay@wordzen.com. In this case, acme.com or wordzen.com is a domain whose email is controlled by Gmail. You can log in to your business’s email account by way of Gmail. What are the basic Gmail sending limits? Regular Gmail accounts have a limit of 500 individual emails/day. G Suite accounts have a limit of 2,000 emails/day. The limits I’ve described above apply only if you’re sending individual emails to one recipient only, the kind that would be sent if you’re using GMass. They apply on a rolling 24 hour basis. That means that if you have a regular Gmail account and you send 500 emails at 2:00 p.m. on Wednesday, and it takes 10 minutes for the emails to send, you won’t be able to send any more emails until 2:10 p.m. on Thursday. Another example: if you send 100 emails from 2 p.m. to 3 p.m. on Wednesday, and 400 emails between 3 p.m. and 4 p.m. on Wednesday, then you won’t be able to send any emails until 2 p.m. on Thursday, at which time you’ll be able to send a max of 100 emails. After 4 p.m., you’ll be able to send more. There are other limits in effect if you’re sending say, one email with 10 email addresses in the To field, and limits if you have your account set to auto-forward, and other limits explained in the URLs referenced above. GMass lets you “break” your Gmail sending limits. GMass includes a feature that lets you send your email marketing campaigns from your Gmail account, but have your emails sent via a third-party SMTP server like Sendgrid. 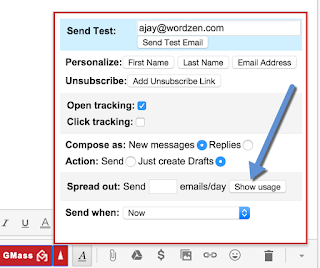 This feature allows you to send an unlimited number of emails from your Gmail account. What happens if you exceed your Gmail account limits? The message refused to send and remains as an unsent Draft in your account. If you’re using any kind of external app to send emails through your Gmail account, the app will be able to successfully connect to your account and place the email in your Sent Mail folder, however the email won’t actually send. Instead, you’ll get a bounce notification indicating the email hasn’t been sent because your over your limit. How can you tell how many emails you’ve sent over the last 24 hours? Gmail doesn’t provide an easy way of determining how many emails you’ve sent over the last 24 hours, other than looking at your Sent Mail folder and manually counting, but GMass calculates this for you and displays it. Click the Show usage button in the GMass Settings box to see how many emails you’ve sent over the prior 24 hours. 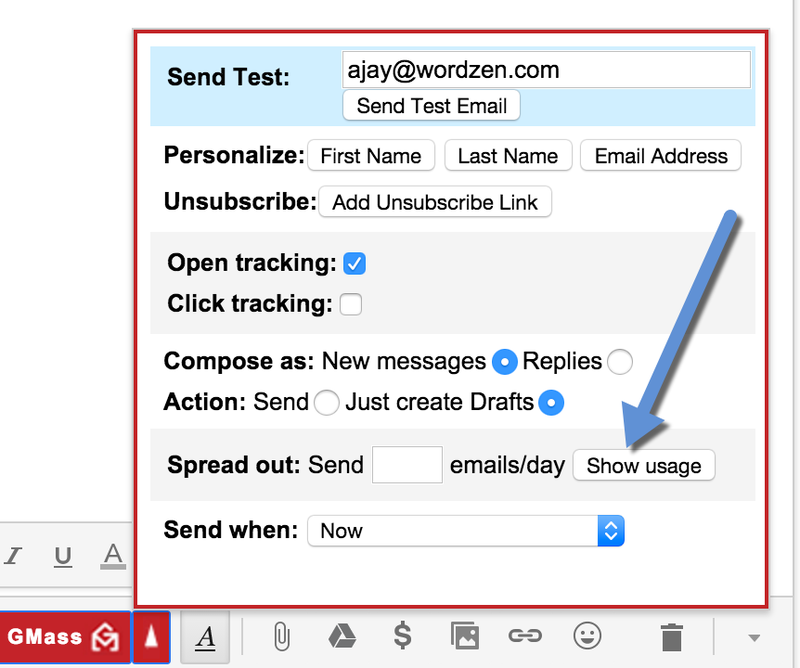 This will help you determine how many emails you can send at any given time. How does GMass manage your account’s sending limits? GMass will automatically distribute your email campaign over multiple days to avoid exceeding your account’s limits. For example, if you have a Google Apps account, where your limit is 2,000 sent emails/day, and you want to send a campaign to 10,000 people, GMass will evenly distribute your campaign at 2,000 emails/day for 5 consecutive days. GMass takes into account how many emails you’ve sent through your account over the past 24 hours when calculating how many emails in your campaign can be sent right now. Let’s say that you’ve sent 15 person-to-person emails through your Google Apps account in the last 24 hours, and now you’re sending a 2,500 person campaign. GMass will send 1,985 emails now, and 515 emails 24 hours later. GMass will pause sending of your email campaign when it detects that you’ve exceeded your account limits. It does this by analyzing the number of your sent emails over the prior 24 hours and scanning for bounce notifications in your account that indicate you’re over your limit. When this happens, GMass will pause your campaign and retry in one hour. How can you re-send emails to addresses that bounced because you were over your limit? If you received the dreaded bounce that is “from” nobody@gmail.com with the Subject “You have reached a limit for sending mail”, you may want to re-send your email to just the recipients that resulted in this bounce. GMass makes it easy using the manual follow-up tool to re-send emails to addresses that bounced because you reached your limit. Those are the fundamentals of Gmail’s and Google Apps’ email sending limits and how GMass navigates those limits to allow you to send large mail merge campaigns. Remember that you can use the GMass unlimited sending feature to avoid these limits altogether. Your mass email has NOT been processed by GMass. Error details: Your email exceeds the 12 MB GMass limit. It is 12769920 bytes. Large images or attachments can cause this. The image I included is only 6.65 MB. Why is this keeping me from sending? This has happened with me too. I get about a dozen or so emails from bounce with other names wishing Happy New Year and now I cannot send mail. Help! Do automatic follow ups count towards your daily limit of 2000 emails per google apps account? I received 240 emails from "nobody@gmail.com" saying :You have reached a limit for sending mail. Your message was not sent." However, when I follow the directions and look for the "Exceeded Gmail Limit" all of the campaigns show zero. Did they resend automatically? Seems that gmass.co support system is awesome! Please contact our support team through http://gmass.co/g/support with a screenshot of any notification you’re encountering when subscribing. If you’re referring to the notification that you’ve reached your sending limit, then that would be the Google-imposed limitation. Our subscriptions do not have usage limits and if your account hits that Google imposed sending limit, GMass will continue to retry sending your emails until your campaign is completed. I attempted to send a GMass email to 44 addresses and got notice that I exceeded my limit. Since I hadn’t sent a GMass email directly, the only explanation I can come up with is that emails sent to test Inbox or Spam are counted toward the 50 email free limit. Is that right? Doesn’t seem fair. Now I have to wait a day or buy a license. I should have noted that I am using the free version, but you probably figured that out. I am trying to send round 1500 and I purchased a licence. I sent them to draft first to check and then clicked the link to send all. I am getting bounce back message saying I have reached my limit. I though a licence for a G Suite account could send 2000 … will these emails eventually be sent or do I have to start this whole process again? Also I am unable to send any normal emails at the moment so work has ground to a halt. Although Google Apps accounts are officially limited to 2,000 emails per day whilst Gmail accounts (those ending with @gmail.com or @googlemail.com) are officially limited to 500 emails per day, we have noticed over time that there are other factors that affect the send limits for an account. Age is a huge factor in this, as Google limit accounts to lower sending capacity until the account establishes its credibility. This is a measure to prevent scammers and spammers from opening accounts and sending at full capacity. With regards to your already set campaign, it will continue to send until all emails scheduled have been sent as Google will allow for your email account. My emails get bounced from today morning. Not able to send emails.